Tentworld: Camp Stretcher Pros & Cons 3 reasons why, and why not! Camp Stretcher Pros & Cons 3 reasons why, and why not! Should I get a stretcher for camping? A commonly asked question, with no set answer. A stretcher can be a great addition for some campers, and a terrible idea for others. Below we explore a few reasons why they're great, and some of the reasons why they're not great. 1) Increases storage space. By using a stretcher you can store your bags, valuables and other personal belongings underneath your stretcher. The OZTent King Goanna Stretcher bed is a popular choice and leaves plenty of room available beneath for some storage. 2) Gets you off the floor. This is especially important if you're not camping inside a tent. If you're sleeping under a tarp and it rains it's not impossible for water to run along the ground under your bed. Generally tents have a water proof floor so this is not so much of an issue then. Some people like to get off the ground with the theory that it helps you keep away from bugs etc. This is not so much of an issue either when inside a tent, but could be useful under a tarp. 3) Easy to get in and out of. Being off the ground really helps with getting into, and out of bed especially if you've got a bad back, knee etc. 1) Less weight - A good thick self inflating mattress on the ground is extremely comfortable, this allows you to do without your heavy stretcher. 2) Save space - Following on from less weight, a self inflating mattress such as the Blackwolf Mega Deluxe Self Inflating Mattress is very comfortable on its own. Adding a stretcher increases the amount you need to pack. Space is often precious when packing your car and trailer! 3) Not great Queen beds - your typical queen stretcher is not great. Queen stretchers, in order to make them useable at all need to have a bar down the middle. This can make bed time cuddles and spooning a little uncomfortable. This can be somewhat overcome on the OZtrail Queen Easy Fold Stretcher by using a OZTrail Queen Leisure Mattress on top. However it does not eliminate the bar entirely. The OZtrail Queen Easy Fold Stretcher is a great double stretcher, but has a bar running down the middle which can make cuddle time unpleasant. To overcome, combine with an OZtrail Queen Leisure Mattress. 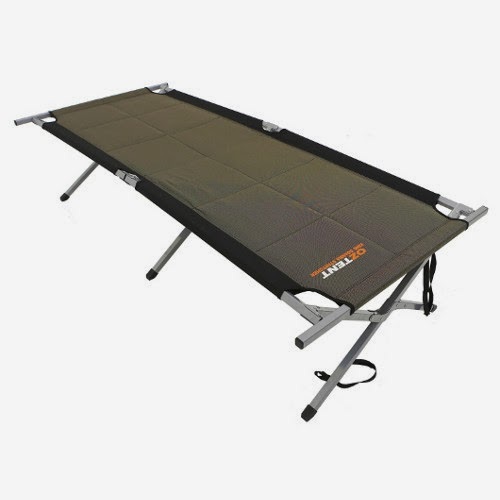 There are other stretcher like beds available such as the OZtrail Queen Instant Anywhere Bed it overcomes this problem using a inflatable mattress on top. Though for many having a standard inflatable mattress is not ideal, due to the trampolining effect that they have. ie - your partner moves, and you then move because of them.